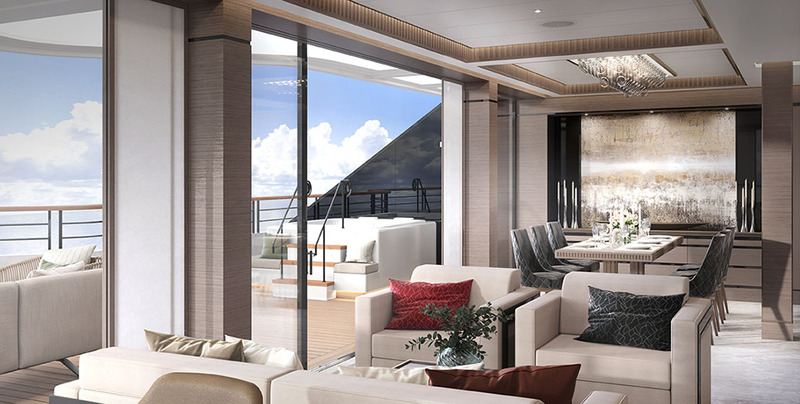 The Ritz-Carlton Yacht Collection is less than a year from launching their first yacht. In this special series, we will feature key milestones from this luxury cruise company as they unveil more details on the design and features of the yacht, and the many spectacular onboard amenities. We begin with a look at their stunning suite designs. 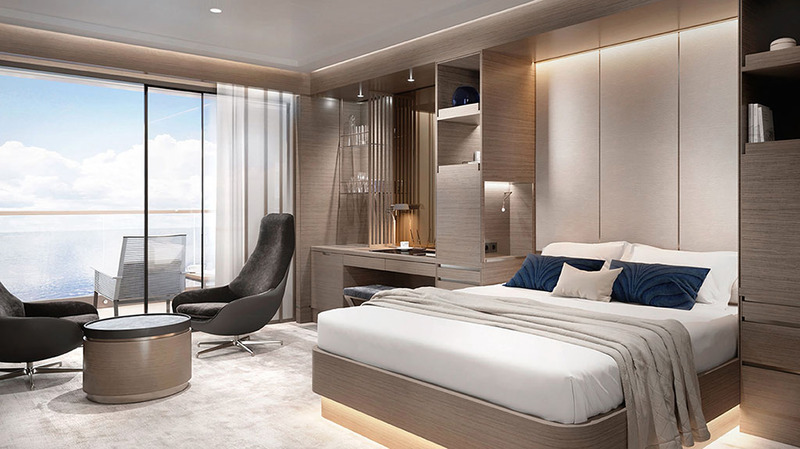 There are six different suite categories, including a two-story Loft Suite, all of which boast a spacious and airy feeling with the décor offering a combination of Ritz-Carlton’s renowned modern elegance and the more casual luxury found on a super yacht. The ceilings are high and the windows on your world offer floor to ceiling views of the seascape. Each suite has an expansive private terrace and all accommodations are designed to assure the finest in comfort. Whichever type of suite you choose, you will have an Espresso machine with complimentary tea and coffee, a refrigerator provisioned to each guest’s preference – The Ritz-Carlton Yacht Collection offers an all-inclusive luxury lifestyle experience at sea – and your welcome will include your choice of a bottle of wine or Champagne. There is complimentary Wi-Fi and each bathroom offers double vanity and most have a bathtub and separate shower. Most suites provide a living room space as well as a dining table – so feel free to entertain new-found friends or simply settle in for a romantic in-suite dinner – naturally there is 24-hour room service. You will also enjoy the expert ministrations of a dedicated Personal Concierge who is your key touchpoint during your cruise offering a seamless and flawless service experience. As you settle into your gorgeous suite you will luxuriate in the expansive space, a custom king bed sleep system, luxury bed and bath linens created expressly for The Ritz-Carlton Yacht Collection, hypoallergenic pillows on request, and both North American and European outlets and a USB charger. A digital flat screen smart TV as well as a make-up mirror and a roomy walk in closet add to the amenities. Suite sizes range from 312 to 1098 sq. ft. with accompanying terraces at 67 to almost 600 sq. ft. In the Owners Suite the terrace also boasts a private whirlpool. During its inaugural year, the yacht will sail in the Caribbean, the Mediterranean, Northern Europe, Canada and New England. For more information, including some great suite fly-thru video tours and a behind-the-scenes video, click here. Originally published in Cruise and Travel Lifestyles, Winter/Spring 2019 issue. Renditions courtesy of Ritz-Carlton Yacht Collection.